The Wotofo Serpent line of atomizers is one of the most popular line of atomizers on the market today, as they bring affordability and excellent performance in one. In addition, in general Wotofo is known for releasing solid quality products, and have been continuing to do so for some time now. Wotofo has now released the newest addition to this atomizer line, which is the Serpent RDTA. This is the first RDTA to be added to this line, and it focuses on much different aspects in comparison to other RDTAs on the market. Before getting any further, I would like to thank Heaven Gifts for sending this atomizer my way for the purposes of this review! I will go over my first impressions, building and wicking, performance, pros and cons, and conclude with whether or not I recommend the Wotofo Serpent RDTA! 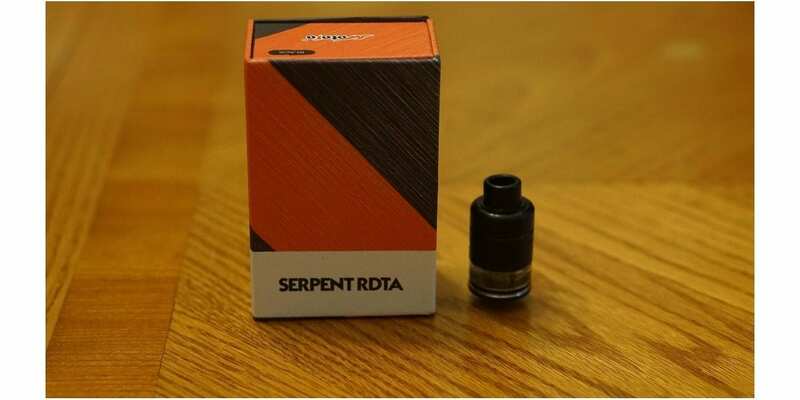 Click Here to Check Out the Wotofo Serpent RDTA! When I first received the Wotofo Serpent RDTA, I immediately noticed the familiar packaging that Wotofo uses for pretty much all of their atomizers. It is relatively a small box, but it does do the job well, which is keeping everything within safe during transit. This atomizer is available in two different color options, which is Black (which is what I received), and Stainless Steel. Included in the packaging, you do receive the atomizer itself, a spare glass tank section, the usual Wotofo giveaway T-Shirt card, an extra wide bore delrin drip tip, a bag of spare parts, coil building tool, Japanese organic cotton, pre-built coils and a user manual. As with all other Wotofo atomizers, you get a ton of extra within the packaging, which is a big pro! Upon taking the Wotofo Serpent RDTA out of the box, my first impressions was that it is rather small, especially in comparison to most other RDTAs on the market. This RDTA does sport an overall diameter of 22mm, so it’ll surely look great on most devices you attach it to. However, I do think this is a subjective con, as many users tend to favor larger diameter atomizers such as 24mm or 25mm. 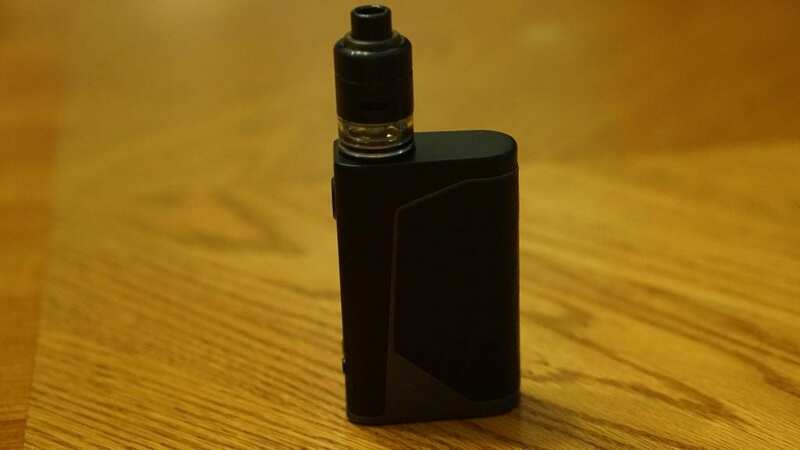 With being only 22mm in diameter, you can expect it’s e-liquid capacity to be quite small, and it is, as it has an e-liquid capacity of 2.5ml. Once again, this is a subjective con, but to me, I don’t mind it since the filling method is great, which is something I’ll touch on later into this review. The Wotofo Serpent RDTA does come pre-installed with the 510 drip tip and insert, and the insert does feature Ultem, which is a fairly new trend we’ve been seeing with many atomizers. I definitely like the added Ultem, especially with the Black color, as it makes this atomizer look even better in my opinion. I do want to mention that in order to take this atomizer apart, you do have to unscrew the 510 pin. Getting everything apart was fairly easy once you take out the gold plated 510 pin, which is surely a pro in my book. The Wotofo Serpent RDTA does feature a conical design in the top cap, which will certainly help with flavor. In addition, the build deck utilizes clamps which can be seen in a ton of different atomizers such as the 528 Customs Goon RDA and Digiflavor Pharaoh Dripper Tank. Also, this RDTA features fully adjustable bottom airflow, with airflow coming in from only one side which is once again similar to the Pharaoh Dripper Tank. Something else worth mentioning is that this atomizer came clean with no machine oil whatsoever, which is a huge pro in my book! One rinse with warm water, and this RDTA was good to go! It’s always nice to have an atomizer come clean! All in all, my first impressions of the Wotofo Serpent RDTA were positive! Even though there were some subjective cons to be mentioned, none were really true cons for me personally. As mentioned previously, the Wotofo Serpent RDTA features a clamp styled build deck, but it only supports single coil builds. This is of course a subjective con, as some vapers may prefer dual coils over single coils. It is not spring loaded clamps that can be found on other atomizers, but it is still relatively easy to build on this RDTA. I do want to mention when you are building a coil for this type of build deck, be sure to have each lead facing the opposite direction. When doing this, it makes it so that each lead will be able to go into the clamp with no issues. You can fit some pretty large builds in this atomizer, but I won’t necessarily recommend doing so since the coil is right below your lips when you are vaping. I was able to easily fit a Fused Clapton coil with no issues, so I’m sure Alien and other exotic coil builds will fit fairly easy. 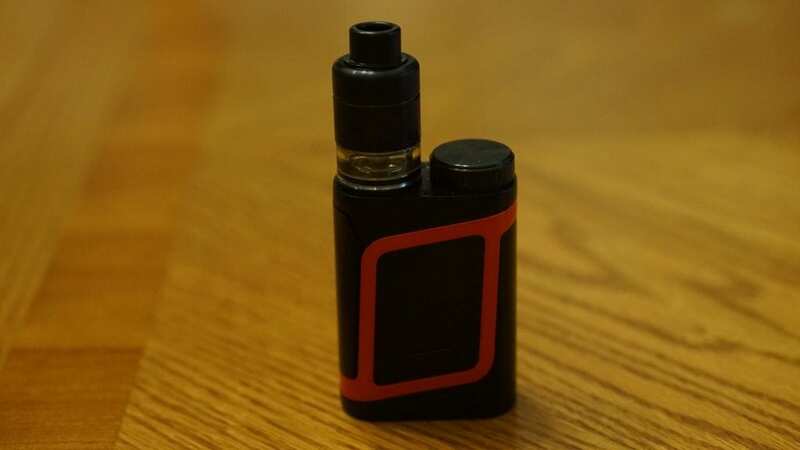 With this type of build deck, I do think that beginners will have little to no issues, and experienced users will literally have zero issues when building on this atomizer. Do keep in mind that the Wotofo Serpent RDTA is only 22mm in diameter, so you won’t be able to fit anything in here, but most coil builds will work just fine. Wicking this RDTA is fairly straightforward as well. If you’re used to wicking other RDTAs, then you won’t have any issues with this one. I cut my cotton so that it barely shows in the juice well, this is what I found to be the most effective way of wicking this atomizer. Also, when wicking Fused Claptons or coils such as this, I do recommend having the cotton a bit tighter than usual to avoid spit back. I do find if you do this, it can help reduce or completely eliminate any spit back issues, and this is something you’d probably want to consider since the coil is relatively close to your lips while vaping. Also, if you find that you are having issues with wicking, take a thin object such as a smaller flat head screwdriver or cotton pick, and simply run it by the edge of the cotton (the side of the edge of the building deck) so that air can escape. This will help certainly help with wicking issues, if you do encounter any. This can be said for pretty much all RDTAs. All in all, building and wicking the Wotofo Serpent RDTA is pretty easy. Both beginners and experienced vapers won’t have much issues, if any with this atomizer, which is a huge pro! Before getting into the overall performance of this RDTA, I do want to mention my preferred coil build for it, which was a single Fused Clapton. The resistance of this specific coil build was 0.36 ohm. I would vape this coil build between 30w and 38w. I did try other coil builds such as simple round wire builds and twisted coils, but I much prefer Clapton or Fused Claptons in this RDTA. They all perform quite well, but I simply prefer these types of coils. Regardless of what coil build you use in this atomizer, you won’t be needing tons of wattage, which is great since you’ll be getting excellent battery life! The flavor and vapor production on this atomizer is excellent! The flavor is what really stood out the most to me in regards to performance, as the flavor was definitely way above average, and I was actually surprised by how great the flavor was. 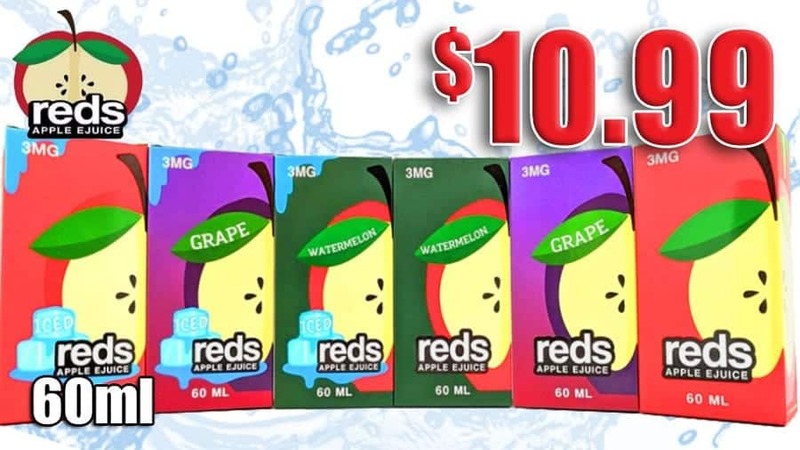 A lot of the products coming from Wotofo lately have been excellent when it comes to flavor, and this one surely doesn’t disappoint! The vapor production was also great, and you can seriously get some good cloud production at under 40w with a single Fused Clapton. As mentioned previously, this RDTA does come pre-installed with the 510 drip tip and includes an additional wide bore delrin drip tip. I much preferred the delrin wide bore drip tip, as I wanted a bit more a wider bore with a single Fused Clapton. Both worked great, but you can definitely notice a bit of a tighter draw with the 510 drip tip. Regardless, it’s still a huge pro that Wotofo includes both of these options! The Wotofo Serpent RDTA does feature fully adjustable bottom airflow. The airflow can be easily adjusted by simply twisting the top cap. The o-rings on this atomizer are great as well, which is another pro to be mentioned. The airflow does come in from only one side, but it is very smooth. I did prefer to leave the airflow wide open as it is pretty restrictive, and closing it off any would make it a bit too restrictive for my liking, especially with a single Fused Clapton. You can get a mouth to lung vape off of this RDTA if you’d like, but it performs much better for direct lung vaping in my opinion. If you like massive amounts of airflow, you probably wouldn’t like this atomizer, as it just doesn’t provide that, but if you like restricted lung hits like myself, you’ll love the airflow! I do want to mention that I did experience some spit back with a single Fused Clapton, but not too much where it became annoying or anything. Like mentioned in the building and wicking section, wicking this type of coil build tighter than usual will certainly help if you run into any spit back issues. The Wotofo Serpent RDTA does have a 2.5ml e-liquid capacity, and features a very easy side fill design. It does have 2 fill ports, so you can fill from either. It is a good thing it does feature 2 fill ports as you do have one fill port open to let air escape when you’re filling. Like mentioned in the first impressions, this is a subjective con, but honestly, it’s not really a con to me since you can fill this RDTA quite quickly with a unicorn bottle. Of course, with a dropper bottle it’ll take a bit longer, but honestly, filling this atomizer is just easy and hassle-free. Something else worth mentioning is that the vape experience is much warmer than usual. I’ve vape this type of coil build in many other single coil atomizers, and I never experienced this type of warmth with the same wattage. I’m not sure as to why this occur, maybe it’s the coil distance from your mouth, but at only 37w, it is a pretty warm vape. I do prefer warmer vapes, so for me it wasn’t a problem, but if you like cooler vapes, then this might be an issue for you. All in all, the performance of the Wotofo Serpent RDTA was excellent! The flavor was definitely above average, and it wasn’t lacking in the vapor production department either! In conclusion, the Wotofo Serpent RDTA is another home run by Wotofo! Wotofo has been releasing tons of great products lately, and this is just another one to add to the list. The flavor off of this atomizer is excellent, especially when you consider it’s a single coil only atomizer. The overall build quality is what you’d expect from Wotofo, and the performance is just stellar. Even though there are some cons that were mentioned, none of them are true cons in my opinion. I know for sure it’ll be cons for some vapers; hence is why I’ve mentioned them, but for me and how I like to vape, they’re not cons. I do think if they released a 24mm or 25mm version, it’ll be more appealing to many more vapers since that’s the normal size for atomizers in 2017. However, I’m glad they went with 22mm as there aren’t that many available, and atomizers like this are great for single battery mods since you don’t need a ton of wattage to get a satisfying vape experience. The Wotofo Serpent RDTA has become one of my favorite single coil RDTAs, and I love using it on the Smok AL85 “Baby Alien” TC Box Mod, as it’s just a great combo, and I get excellent battery life! All in all, the Wotofo Serpent RDTA is a solid performing atomizer! If you’re looking for a new single coil RDTA with amazing flavor and is easy to build and wick, then I can easily recommend this atomizer!